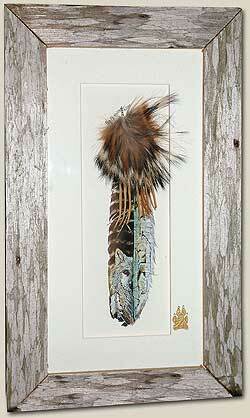 Hand Painted Feathers - "White Wolf Medicine"
This wolf's best view is from behind this aspen. She has magic in her eyes. Her name is Chunka. This is an artist signed piece and includes certificate of authenticity. The sample at right is shown with barn-wood framed, matted and glazed..
To get your Peg Fennimore art, please check our art for sale page or contact us about a custom commission.